This newsletter issue might be a bit different from my usual: the interview might get cut (my planned interviewee initially agreed but has been incommunicado). So, there might be a different overall plan for this issue. In the meantime, I’ve been having fun experimenting with different centers for a butted hexagon, since hexagon rugs will be the teaching topic. 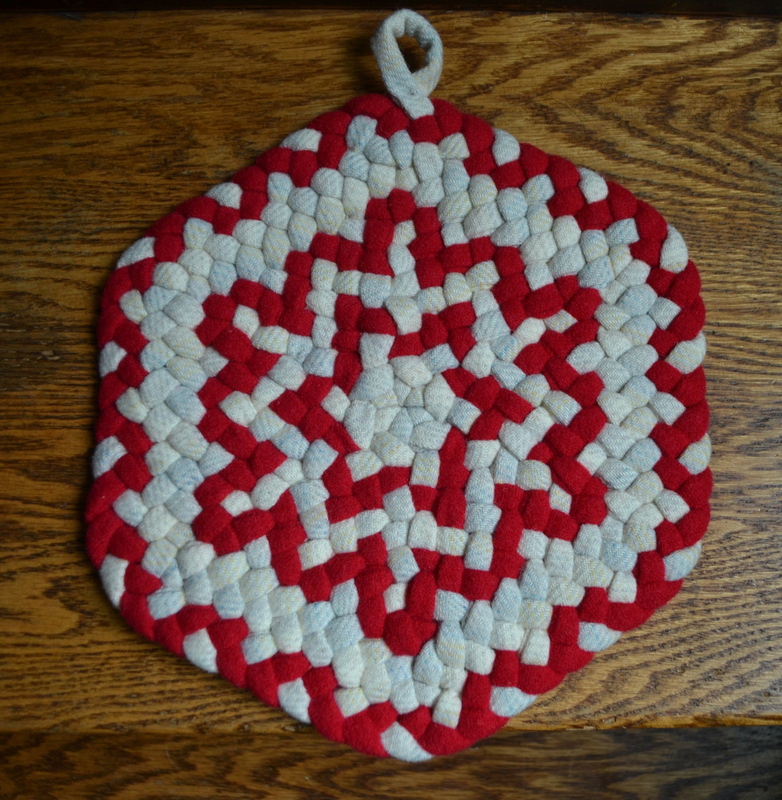 I’ve always loved the hexagon trivet — see photo — and always wanted to experiment a bit with variations. 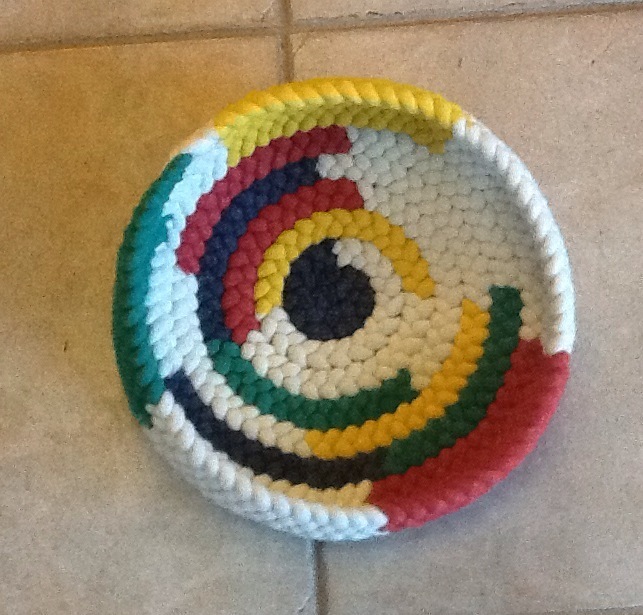 The trivet in the photo has a 6-loop center (made just like a 9-loop center, but smaller) and is followed by a DC-1-DC row (double corners separated by one loop). I also experimented with a quickie-6 center (made of only two strands) that fits a little more easily into the DC-1-DC row. It’s tiny — see photo below. Then I’ve been figuring out how to make the Betty Mutina Center, which is a 12-loop, 6 double-corner center. It’s quite pretty! Here’s one that Pam Rowan gave me as a sample: see below. 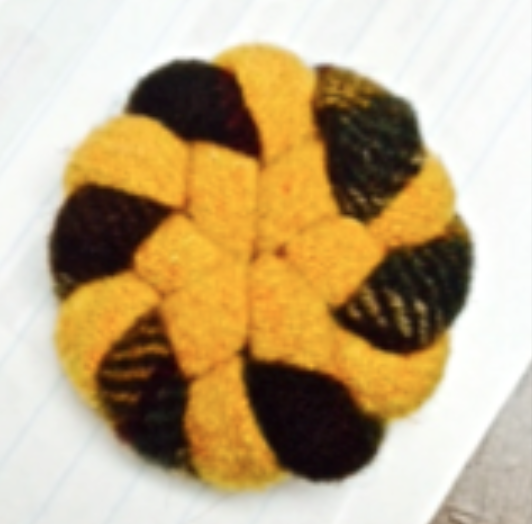 The nice thing about this center is that it can begin the 6-sided star pattern with its darker outer strand. Due to the dark strand’s position as the first loop of every double corner, this darker strand stays only on the outside loops of the braid. Then I’ve been playing with different patterns for the star in subsequent rows… here’s a look at one that I threw as much patterning in as I could… and I think it’s a bit busy. But it was fun to make! 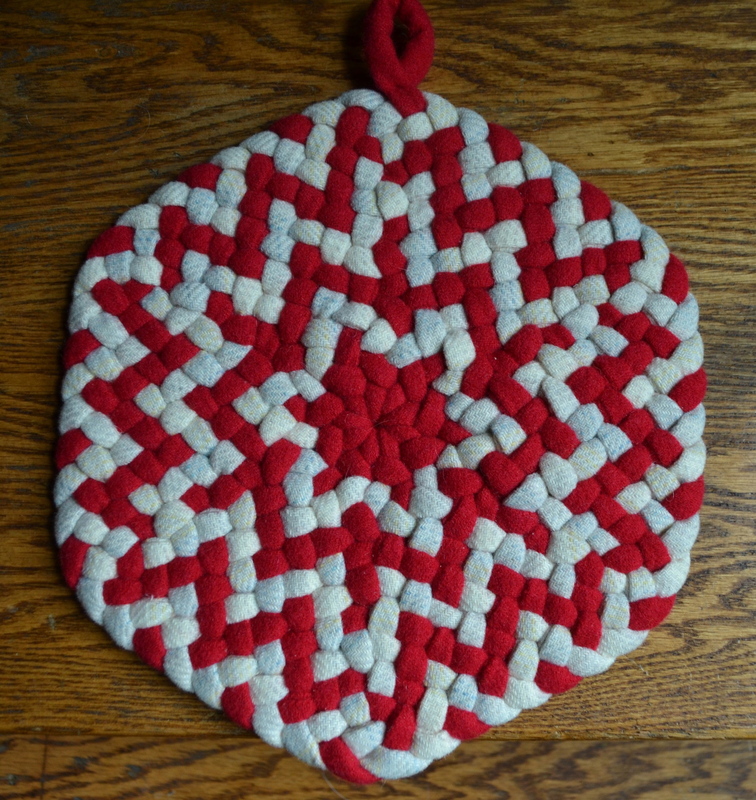 Now I just have to stop thinking about multistrand patterns and hexagon trivets. I WILL NOT THINK ABOUT MULTISTRAND PATTERNS AND HEXAGON TRIVETS. If I do, I will never finish the newsletter. I WILL NOT THINK ABOUT IT. Christine here. Recently, Kris McDermet and Dianne Tobias and I went to the ATHA (Assoc. 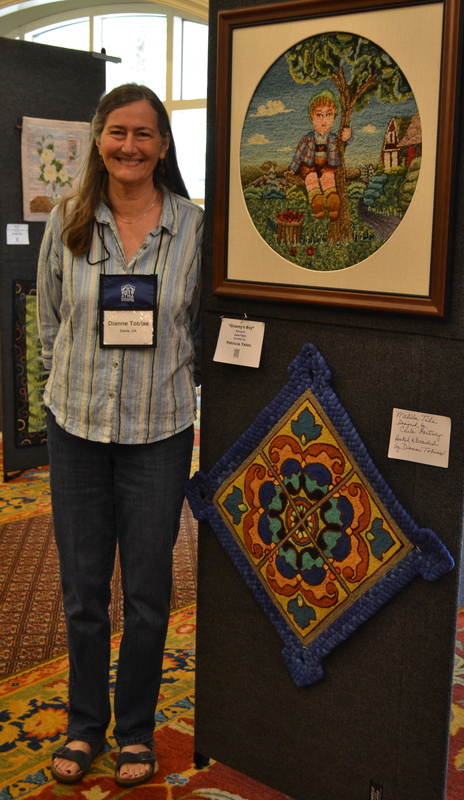 of Traditional Hooking Artists) biennial conference in San Antonio, Texas. 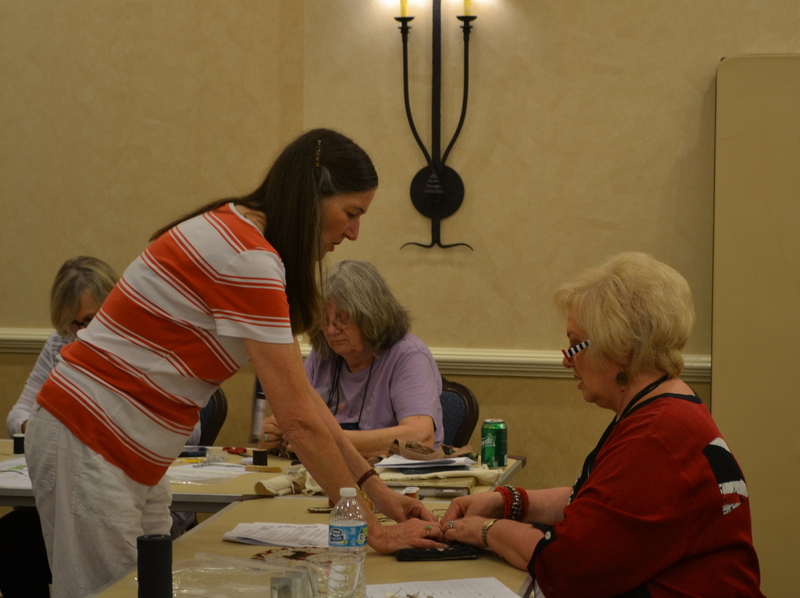 How did a confirmed rug braider end up at a hooking conference? 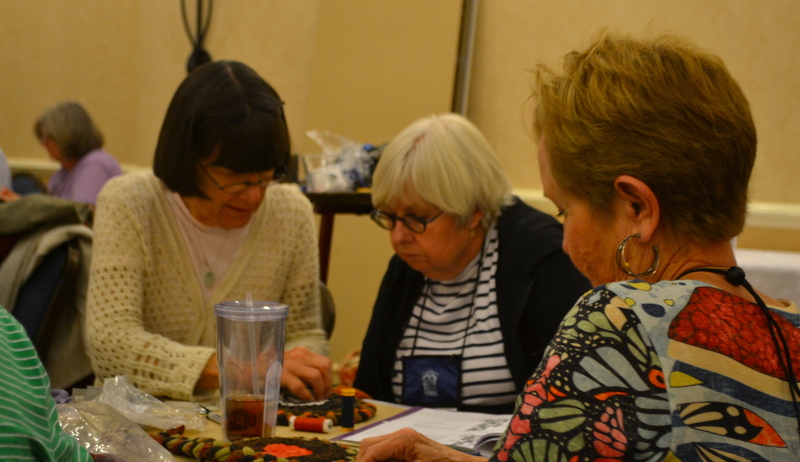 We three taught a class on attaching braids as a border to rug hooking. It was actually Kris and Dianne’s class, but when the registrations ran over a manageable number, I got pulled in the back door to help them out. I’ve taught this class before, so it wasn’t quite as intimidating as it could have been at a forum such as that. I trotted out my same samples of rug punching (which looks the same as rug hooking, just a little messier — when made by me anyway). The class went well, I think… when we would run into our students later that weekend, they were full of praise for all of us as teachers, which was very nice to hear. One of the statements that we heard again and again was how nice it was to have a completed project to take home, instead of just a started rug that would have a zillion more hours of work. This conference has sent my mind in a bunch of different directions. I’ve been thinking about the culture of different crafts, the comfortable big-ness of braids, the slightly unsettled feeling of forcing yourself to work in a new craft, and the down-sizing of projects. First, the culture of different crafts. I felt that there was a slightly different “feel” to the hooking conference. OK, maybe some of that feeling was due to the plush and extravagant surroundings: it was a bit different to stay at the San Antonio Westin River Walk Hotel rather than the St. Basil’s Seminary where you make up your own bed… pulling sheets over a plastic-coated single bed and running down the hall to the bathroom. The St. Francis Retreat Center is a bit “prettier” but still is nonetheless a former Catholic girls’ school. So some of the different feeling was just that braiders tend to keep things lower cost and have a more frugal approach to conferences. We also don’t have large enough numbers to be able to draw 500 people from across the country the way that the hookers did. Some of what I like about braiding, though, is that it still is a smaller, more intimate, and more frugal group. Perhaps due to more than a few years as a younger woman where I barely had enough income to cover my bills, I still wince a bit when I have to spend money. I like recycling wool from thrift stores. 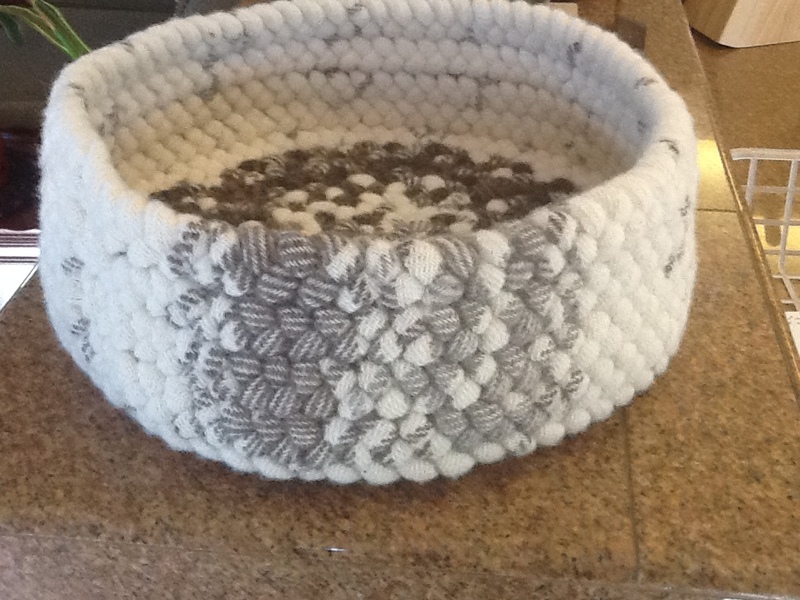 I like putting recycled wool into each project that I make. 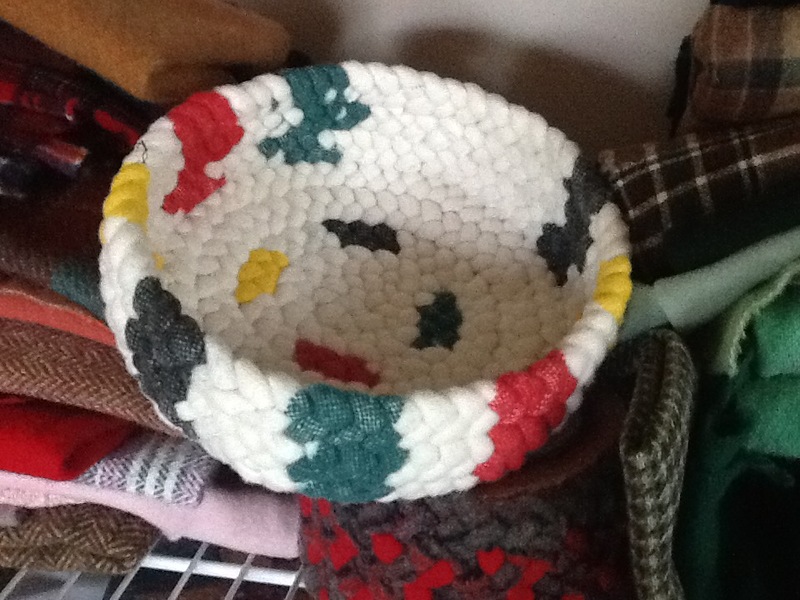 Recycling wool saves money, of course, but it also connects me to the roots of the craft, as when my grandmother made “rag rugs” braided from my father’s and uncles’ clothing. It makes me happy to re-use wool in my fat braids. 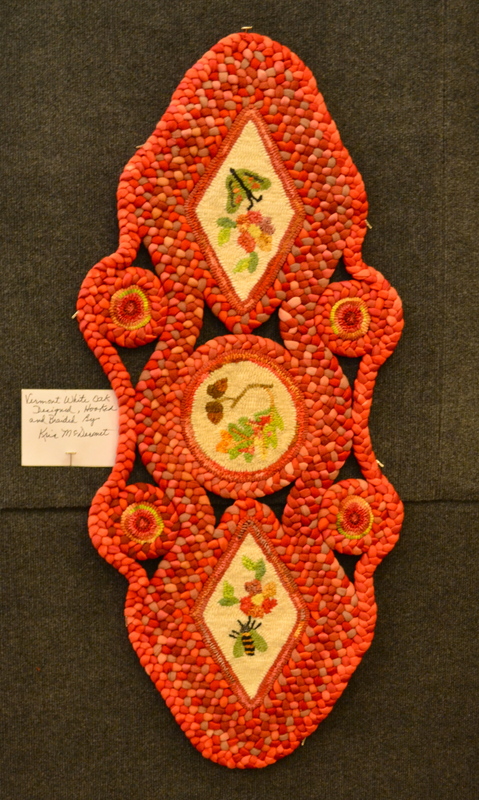 On the surface, the similarities between rug hookers and braiders are certainly clear – both fond of wool, both making rugs, both obsessive crafters. 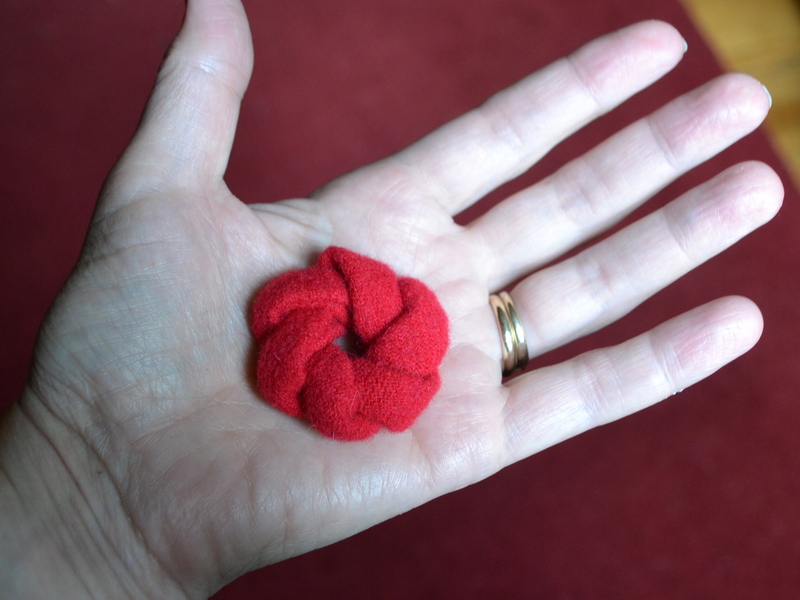 But… the pictorial aspect of hooking makes it a bit different. 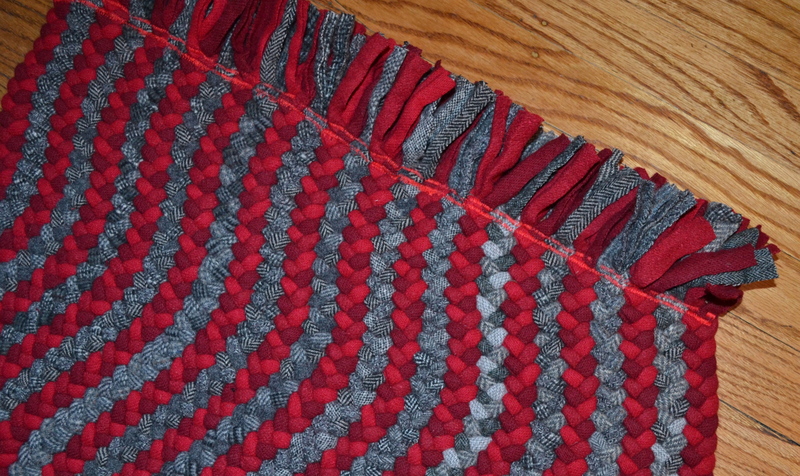 While Delsie Hoyt is a unique example of a “pictorial” braider, most of us braiders have a more diffuse and fuzzy design in mind for our braided rugs. Do I think a braided rug can be “art”? Absolutely. But it’s a different, more impressionistic art than the clear pictures drawn by rug hookers. Most of us braiders still USE our rugs on the floor, too… which seems pretty unusual for most of the hookers I spoke to at the conference. Christine here: Due to some camera or perhaps camera-cord difficulties, I also (along with Dianne) have had difficulty posting recently. But, I have figured out a work-around that involves removing the memory card and inserting it into the one desktop computer that can recognize it, then copying it to a flash drive and importing the photos to my laptop. Excessively complicated but at least it works now!! The curves were completed by making a series of increases and decreases. 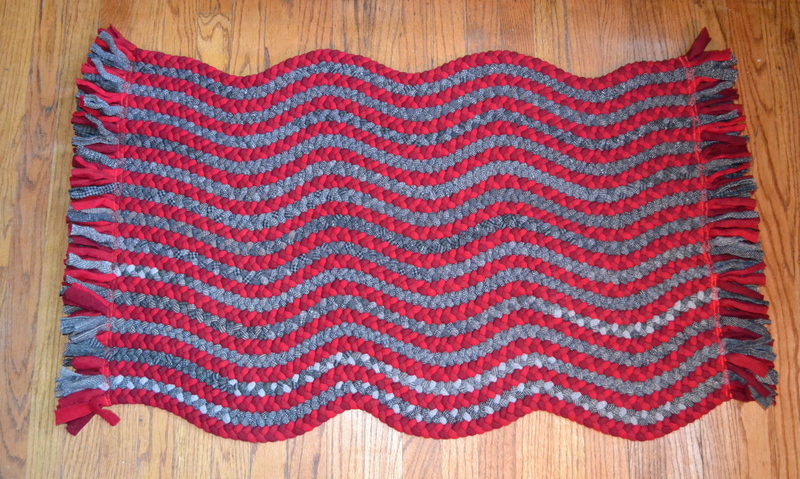 After multiple attempts at deeper curves, I realized that the most I could put into the rug (and still keep the braids perfectly parallel) was 1 increase or decrease per curve in the red braid and 2 increases or decreases per curve in the gray braid. Any more increases/decreases than that, and I lost the parallel aspect and they had to become expanding and shrinking curves, if that makes sense. 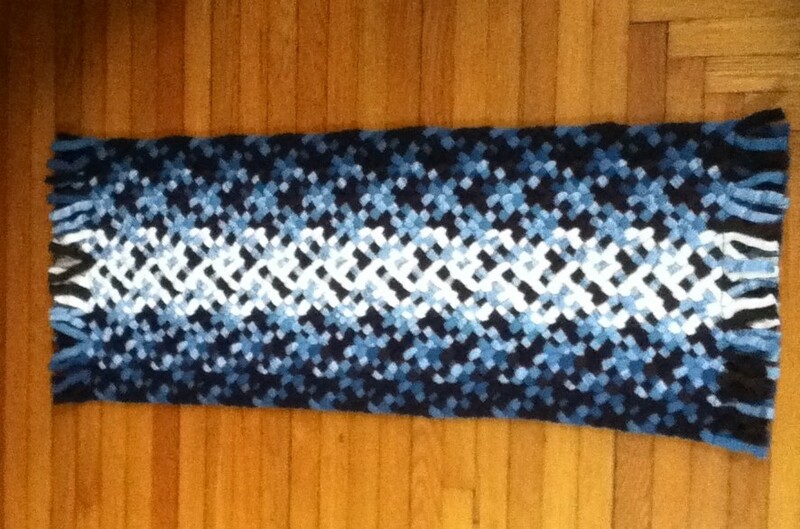 2 rows of zig zag across each end. I was able to finish the rug on my home machine (Husqvarna Viking “Quilter” edition) with a new pack of jeans-weight sewing needles. 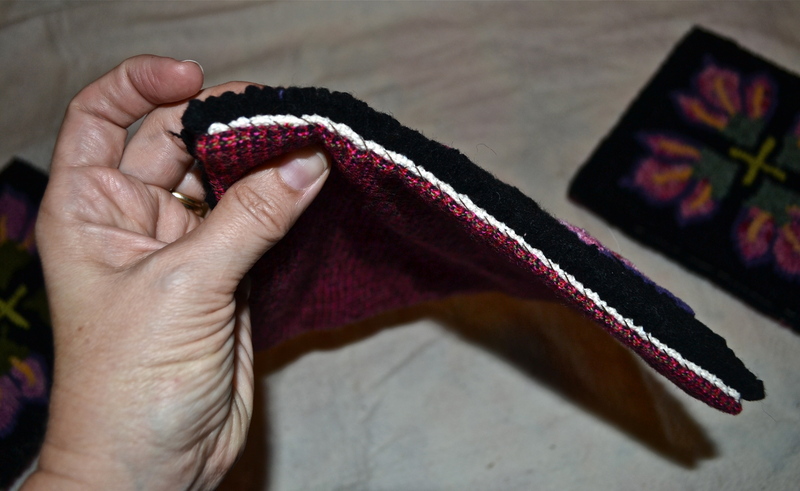 I did 2 rows of fairly tight zigzag stitch across each end. I went through 4 needles. So it’s not a perfect technique… but easier than sending it off in the mail (Pam Rowan will finish these strip rugs on her industrial sewing machine if you send them to her: prowan@metrocast.net). I plan on putting several rows of braid around the squares and spent all day yesterday dyeing yards of pinky-purple fabric… which turned out too dark initially, darn it, so I tried again with less dye and it still came out darker than I wanted… that magenta is really powerful stuff, isn’t it? Anyway, after torturing myself with all the rug punching, all I want to do is braid. Final comment: I was reading an essay on Robert Southey, a poet from the early 1800’s who was fond of creating new words: an example is “autobiography.” One of his 400 created words was agathokakological (composed of both good and evil). He apparently planned a literary utopia withe Samuel Taylor Coleridge on the banks of the Susquehanna River in my home state of Pennsylvania, but they couldn’t ever agree on the location so the plans fell apart. (Probably for the best: few of those 19th century utopian societies lasted). Anyway, reading about him inspired my own neologism: pathoplekophilia: a pathological love of rug braiding. 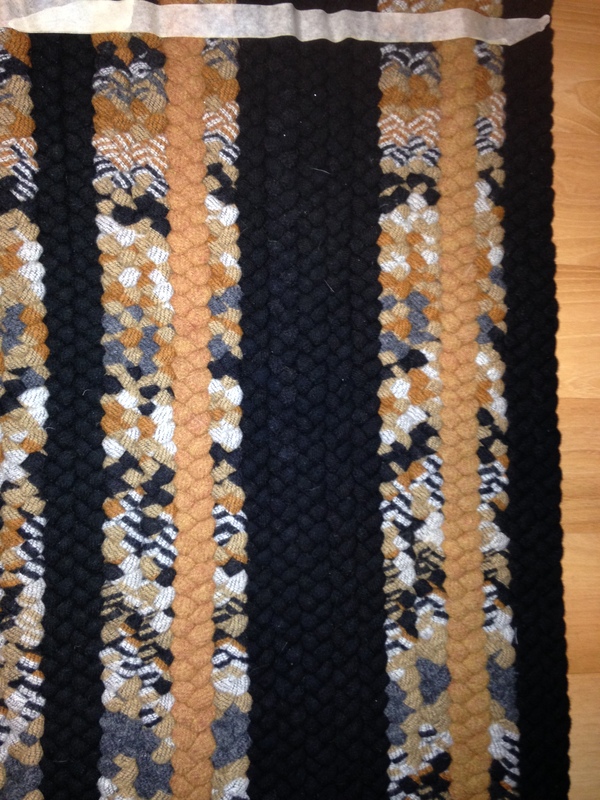 I took a class from Deb Weinhold at the Valley Forge Braid In last April on strip rugs. I had never made one before; to be honest, I was wary of the fringe being a tripping hazard; wondered how I would stitch the ends; and thought straight braiding might be boring. Wrong! Pendleton selvedge I had. It was a jacquard design, so pretty stiff and quite narrow (<1.5″ wide), but I liked the colors, had alot of it and planned for it to go width-wise across an entryway that is covered in bamboo flooring, so the fringe wouldn’t be a hazard. You can see from the pictures the design, the pins at one end and the masking tape at the other to keep the sewing line straight. At Deb’s suggestion I did not e-lace or shoelace the center braid, but laced normally – the result is that one end-length of the rug has folds exposed…it is going near the door so no one will know….I had little trouble keeping it straight when lacing. The problem came when I tried to find someone to stitch the rug across the ends. My sewing machine froze when I tried it so took it to a shoe repair place who tried, but the ‘arm’ of the machine is very small and there would be no way they could keep it straight….he gave up and suggested the sewing machine place across the street: an old fashioned sewing machine and vacuum place. The owner is Ukrainian and extremely nice. He was cautiously up for the challenge. He used a fancy machine in the back; all I remember is that it has a well underneath it filled with machine oil and it continually bathes the moving parts in oil…He stitched it for me; not perfectly by any means; it was hard for him to keep the line straight and you can see from the pictures that has affected the shape of the rug somewhat-wider at one end. 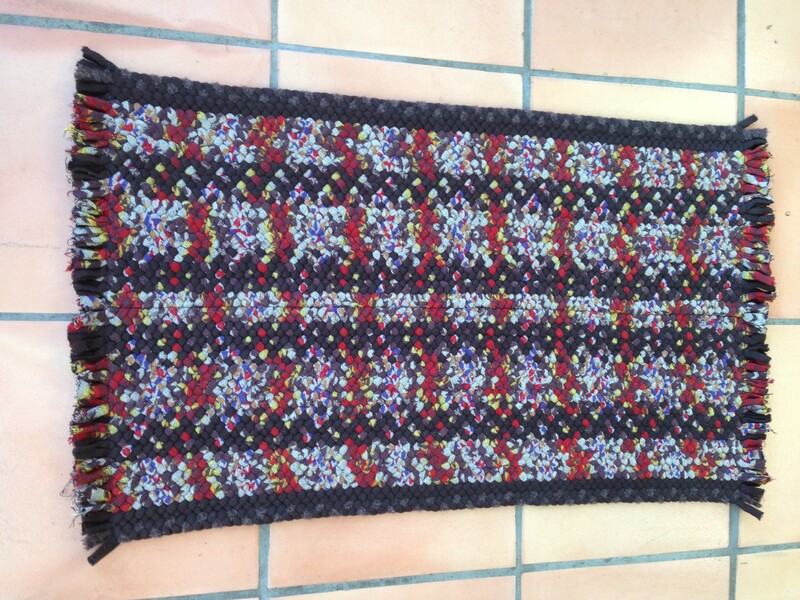 But I have already started another and would encourage those of you who have not done a strip rug, to try one, with or without designs the way I did it. Another way to insert designs is in the placement of the fabrics as Christine has illustrated in our book in the pattern section. Edit: Peggyann Watts from NY has sent me a good example of the patterns you can get by placement of the fabrics. Not sure if this IS a strip rug or an example but it would make a great strip rug! Two last things: I apologize for not getting this post out sooner, not having better photos, especially of the rug in place, and for being a quiet blogger these last few ?months. I have been trying to organize my fiber photos between my PC and ios devices without luck…until I found a smart ‘apple’ helper who listened to me and helped. So far so good! 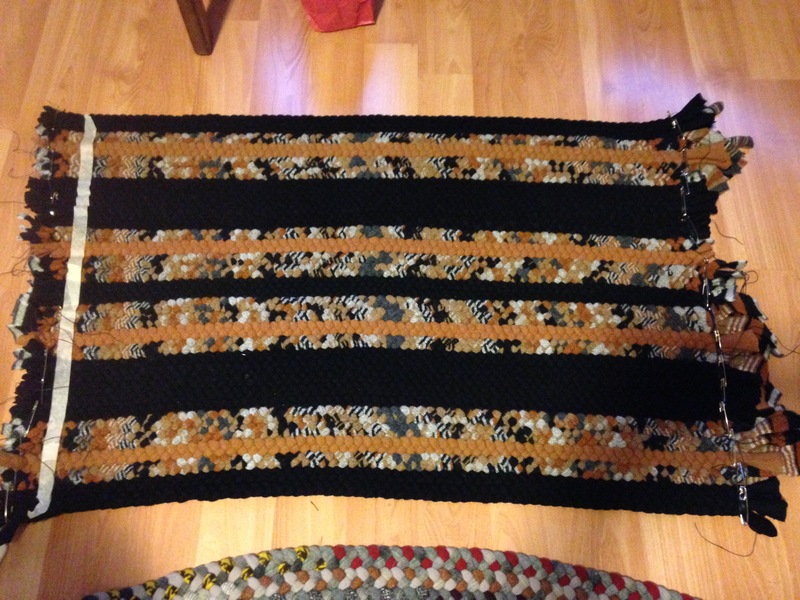 Edit: Sandy Busby from OR has sent me a wonderful example of a patterned strip rug using the same type of Pendleton selvedges…she is lucky to live close to the source. Look how well her strips match. 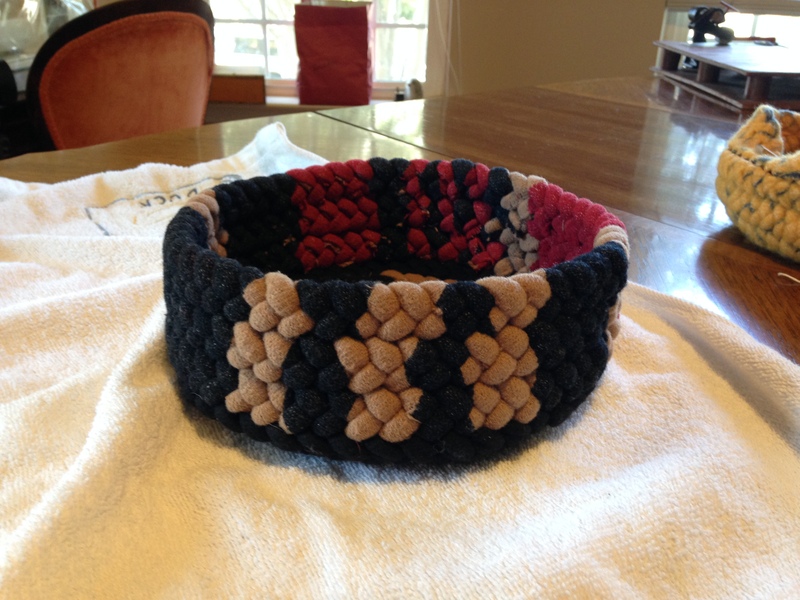 And the other thing…I will be teaching a Patterned Hybrid Basket class at New England Braids in October using the same type of selvedges and concept to make baskets that have stacked,matched designs as this one. Let me know if you want information on the class.